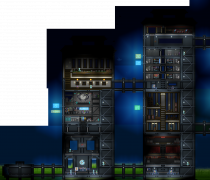 Inside a Hylotl Underwater City. 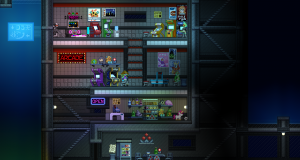 Hylotl Underwater City is a Hylotl themed dungeon made up of an airtight underground facility, enterable via airlocks at the ocean floor. 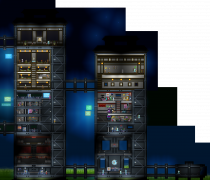 The tall towers underwater house modern city furniture like arcade machines, vending machines and neon signs. There's a shield generator inside the city, usually atop one of the towers. This must be deactivated before any objects can be picked up inside the city. Be careful when opening up the walls of the city, it will quickly flood. These cities can only be found underwater on ocean planets. They won't be found anywhere else in the universe. Action Movie Poster Decorative 55 A framed poster from the movie "Cybernetic Apocalypse". Air Hockey Table Decorative 80 A classic air hockey table. First to ten wins! Arcade Prize Counter Decorative 145 A glass case full of plushies and toys. Asphalt Block 0 A cheap but effective construction material. Bad Goo Plushie Decorative 45 Bad Goo Plushie. A cuddly goo doll. Bathroom Hand Dryer Light Source 50 A handy hand dryer. Hands off. Bathroom Sink Decorative 55 A bathroom sink. Wash your hands! Bathroom Stall Furniture 110 A bathroom stall. Don't get stuck! Bathroom Urinal Decorative 55 A bathroom urinal. Useful for some. Blue Base Button Wire 70 Who knows what it might activate... just press it! Blue Chair Furniture 70 A teal blue chair. Blue Neon Shop Sign Decorative 180 Small ocean creatures swim within this sign. Blue Shell Sign Decorative 195 A blue neon sign decorated with a seashell. Classic Candlestick Light Source 85 A golden candlestick with three prongs. The wax never seems to melt. Classic Chandelier Light Source 120 This chandelier is made of wrought-iron. It looks expensive. Club Decks Decorative 160 The huge speakers pump out loud dance music. Club Speaker Decorative 70 A large club speaker. Comedy Movie Poster Decorative 55 A poster for a unpopular Hylotl movie "Claw of Dread". Dance-Dance Machine Decorative 240 Let's play some Dance-Dance! Decorated Music Box Decorative 450 An intricate handmade music box. The melody it plays is soothing. Deprived Bookcase Decorative 225 A fairly big bookcase, only partially filled with books. Durasteel Bed Furniture 180 A comfortable durasteel bed. Looks pretty sleek. Eight Decorative 20 Eight marker. Empty Petal Nectar Bottle Breakable 5 An empty bottle of petal nectar. Empty Root Pop Bottle Breakable 5 An empty bottle of dandelion root pop. Engraved Tombstone Decorative 50 This tomb is anonymous, engraved with the image of its occupant. Fancy Plaque Decorative 40 A fancy plaque with an inscription on it. Five Decorative 20 Five marker. Globe Statue Decorative 240 A large bronze statue of the Hylotl's home planet. Green Arcade Machine Decorative 120 This machine runs a game called 'Stylish Thief Wasteland'. Green Neon Pod Sign Decorative 180 A sign displaying reefpods, a tasty delicacy. Hazard Block Block 0 This pattern suggests caution. Hylotl "Lily" Calligraphy Decorative 60 Framed calligraphy for 'lily pad'. Hylotl "Pond" Calligraphy Decorative 60 Framed calligraphy for 'pond'. Hylotl Armour Stand Decorative 50 A stand displaying Hylotl armour. Hylotl Counter Decorative 145 A counter that oddly resembles a Hylotl. Hylotl Fashion Hologram Decorative 140 A hologram displaying the latest trends in Hylotl fashion. Hylotl Table Decorative 110 A table with a studded gem motif resembling the three eyes of the Hylotl. Kitchen Counter Crafting Station 100 Used to produce wholesome foods with a variety of effects. Kitchen Tools Decorative 60 Tools for creating pure, unadulterated deliciousness. Laboratory Light Light Source 85 A sleek red wall light. Large Cooler Refrigerated Storage 180 Perfect for storing a lot of food and keeping it fresh. Liquid Sensor (2) Wire 55 Don't use your finger! This trusty sensor indicates the presence of liquids. Little Lily Pad Decorative 50 A small lily pad decoration. Lunar Base Block Block 0 This alloy looks incredibly durable. Metal Cabinet Storage 85 It looks like it's full of hazardous materials. Metal Lily Pad Decorative 120 It looks like a decorative lily pad. Mindwurm Plushie Decorative 50 A questionably cute plushie of a Mindwurm. Mirror Block Block 0 A non-reflective mirror. Modern Table Furniture 60 A fancy modern table to place fancy modern things on. Moleman Poster Decorative 80 A framed poster for cult hit, "The Moleman Prophecy". Neon Hylotl Sign Decorative 85 A neon sign depicting a Hylotl head. Numi Sign Light Source 105 A sign advertising Numi, a famous mascot from a Hylotl children's cartoon. Orange Apex Sign Decorative 195 An orange neon sign displaying what seems to be Big Ape. Orange Arcade Machine Decorative 120 This machine runs a game called 'Sleazy Burger Heroes'. Orange Neon Collector Sign Decorative 180 A sign seeking Hylotl to collect spawn from the surface. Orange Neon Sign Decorative 180 It looks like the word 'croak', but apparently it means something completely different. Outdoor Stool Furniture 55 A smart metal stool, suitable for the outdoors. Painted Brick Block 0 Nicely painted brickwork. Plastic Fake Plant Decorative 60 A replica plant, it is obviously made of plastic. Platinum Block Block 0 A whole block of solid platinum. Poptop Plushie Decorative 50 A soft Poptop plush toy. Pressurised Airlock Door Door 175 A sturdy airlock door. Pressurised Beam Block 0 A support beam made for pressurised environments. Pressurised Durasteel Block 0 A durasteel panel, specially designed to contain pressurised environments. Pressurised Girder Block 0 A girder designed to accommodate pressurisation changes. Pressurised Platform Platform 0 Platforms made for use in potentially pressurised environments. Pressurised Support Decorative 60 A structural support beam able to withstand deep-sea pressure. Priest's Tombstone Decorative 50 This tombstone belongs to a priest, fallen in battle. Purple Arcade Machine Decorative 135 This machine runs 'Screaming Fashion Agent'. Quill and Ink Decorative 45 A quill and ink. Red Arcade Machine Decorative 105 This machine runs a game called 'Cool Wizard Island'. Red Light Light Source 60 A dim red light. Red Toy Block Block 0 A large stackable toy block. Reinforced Tech Block Block 0 Wiring hides beneath this reinforced hi-tech plated material. Romantic Movie Poster Decorative 70 A framed poster from the controversial romance film "10 Things I Hate About Florans". Ship Support Block 0 A wall support used in ship construction. Shipping Container Storage 625 A very large shipping container. Short Durasteel Elevator Wire 200 This durasteel elevator will get the job done. Silver Block Block 0 A whole block of silver. Small Deprived Bookcase Decorative 160 An ornately carved bookcase. It's only partially filled. Small Ornate Bookcase Decorative 160 An ornately carved bookcase. Small Wall Switch Wire 20 Flippin' awesome. Small Waterproof Light Light Source 45 A tiny wall light. Smooth Metal Block 0 Smooth metal, cold to the touch. Smooth Plated Block Block 0 Reminds me of the inside of a medical centre. Starbound Arcade Machine Decorative 135 An arcade machine running a game called 'Starbound'. Stone Tiles Block 0 Tiles made from smoothly polished stone. Study Lamp Light Source 75 A study lamp for a library or desk. Very fancy. Tall Fluorescent Lamp Light Source 85 A blindingly bright fluorescent light. Tiny Lily Pads Decorative 60 A small set of lily pad wall hangings. Titanium Panel Block 0 A smooth panel made of titanium. Titanium Table Furniture 80 A stylish titanium table. Traditional Bridge Painting Decorative 70 It's a painting of a bridge over still water. Traditional Sword Rack Decorative 70 A rack of traditional swords. Traditional Wardrobe Storage 145 The lily pad rotates to lock its doors. Turtle Plushie Decorative 50 A cute little turtle plush. Unicorn Plushie Decorative 50 A squishy, adorable unicorn. What's not to love? Unstable Tombstone Decorative 50 This tombstone looks as if it's about to fall over. Vertical Danger Sign Decorative 50 The sign says "DANGER". Wait, how do these people know my middle name? Vertical Hazard Tape Decorative 20 This brightly coloured tape clearly indicates that the area is unsafe. Vintage Library Poster Decorative 250 An old poster of some ancient Hylotl library. Virorb Plushie Decorative 40 An adorable Normal Virorb plushie. Wall Panel Block 0 A sleek metal wall panel. Water Cooler (outpost) Decorative 55 A water cooler. The best place to find the hottest gossip. Wide Fluorescent Lamp Light Source 85 A blindingly bright fluorescent light. Wooden Sink Decorative 85 A wooden cabinet with a sink installed. Yellow Arcade Machine Decorative 120 This machine runs a game called 'Zombie Banana Mansion'.